I sometimes think I’ve seen everything there is in the sky, with nothing new left to see. Then I get a rude — but welcome — wake-up call. 1) What the frak is that? 2) This must be a fake! But it’s not fake. It’s real, and it’s the dying gasp of a very, very strange star system. Red giants tend to blow a lot of their outer layers into space in an expanding spherical wind; think of it as a super-solar wind. The star surrounds itself with a cloud of this material, essentially enclosing it in a cocoon. In general the material isn’t all that thick, but in some of these stars there is an overabundance of carbon in the outer layers which gets carried along in these winds. In these cases the material is very dense and opaque (carbon forms long, complex molecules that are very effective at absorbing visible light), and can completely block the light from the star. All we see is the warm glow from the cocoon as an infrared glow. AFGL 3068 is a carbon star and most likely evolved just like this, but with a difference: it’s a binary. As the two stars swing around each other, the wind from the carbon star doesn’t expand in a sphere. Instead, we see a spiral pattern as the material expands. This is called the sprinkler-head effect. As a sprinkler spins, the jet of water appears to take a spiral shape. Each individual drop is moving directly away from the sprinkler head, but the rotation of the head itself creates a global spiral pattern, with the arms appearing to expand. It’s not precisely an illusion — the spiral pattern is definitely there — but the arms aren’t an actual physical structure. It’s just the way we interpret the way the drops move away from the sprinkler. We see the same thing (on a much smaller scale!) when spinning comets give off gas, too. Going back to our sprinkler analogy, if you’re standing in the yard as the sprinkler spins, you get hit with a blast of water. Wait a few seconds and you get hit again. Obviously, the time between soakings is the time it takes the sprinkler head to spin once, right? That means that we can measure the arms of AFGL 3068’s spiral and calculate the rotation period of the binary! The expansion rate of the spiral material is about 15 km/sec (9 miles/sec). Given that distance, the time it takes between spirals turns out to be a little over 700 years. So if you were hovering in space outside this object and an arm swept past you, you’d have another 700 years before the next one blew your way again. But there’s more! Using the monster Keck 10-meter infrared telescope, the astronomers who observed the object were able to see through the dark material to the binary inside (IR gets through the thick cloud of material more easily than visible light). Making some simple assumptions on the masses of the stars, they find the orbital period is about 800 years: very close to the spiral pattern’s period, given their estimations. That also lets me measure the number of spirals — roughly five — and calculate the size of this object: about a third of a light year across, or more than 3 trillion kilometers! So after boggling at this picture for a few minutes and marveling at the object it depicts, I had to wonder: while carbon stars are rare, they’re not totally unknown, so why don’t we see more of these amazing spirals? I think I know why. For one thing, the carbon star at the center would have to be in a binary. That cuts back on their numbers. And more importantly, on a galactic timescale they just don’t last all that long; millennia as opposed to millions or billions of years, so we have to catch one at just the right stage. I doubt there are more than a handful of these objects in the entire Milky Way. And also… this thing is faint. Really faint. This picture was made using 33 minutes of time on one of Hubble’s most sensitive cameras, and you can still barely see it. Why is it so faint? Well, the stars inside can’t light it up; their light is blocked by the material closer to the stars. So what is lighting it up? 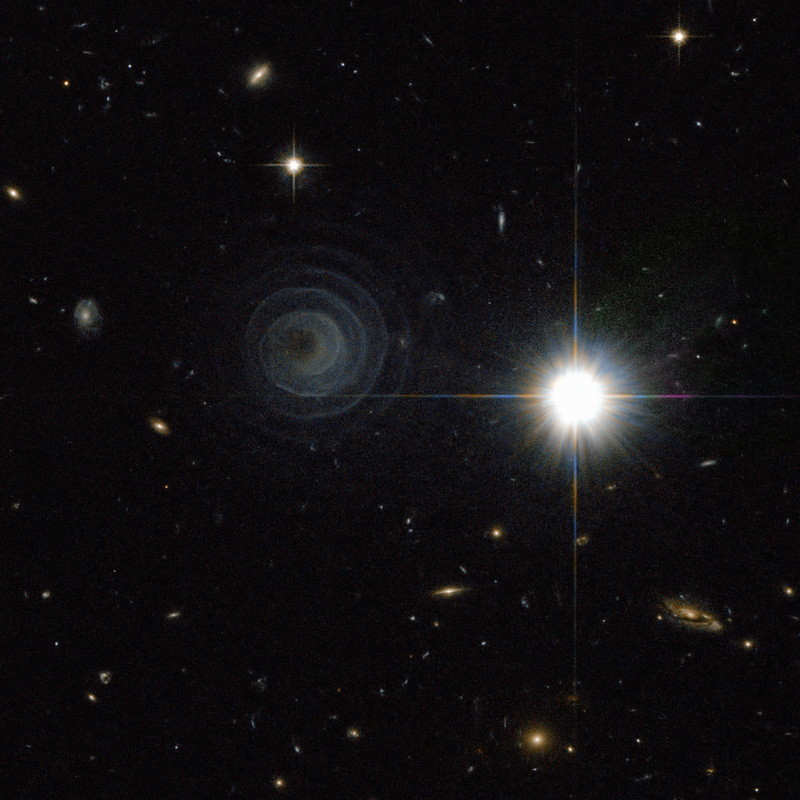 Get this: the astronomers who observed AFGL 3068 think the spiral is being lit by galactic starlight. That’s incredible. The combined light of the distant stars is very, very dim, so it’s amazing to think it may be the only source of light on this object. Note that the spiral is slightly brighter on the right side than the left. It turns out that the galactic plane — where stars are most populous — is in that direction, so that fits. I have to wonder about that bright star in the image, too. It looks to be in the right direction as well, but we don’t know if it’s really close to us (in the foreground) or much more distant (in the background). In other words, it may be way too far from AFGL 3068 to be illuminating it. All in all, this is an amazing system. The beauty of it is undeniable, as well as the astonishing and intricate nature of how it was formed. And for me it holds even more charm… because it reminds me that there are always more things to see, more surprises the Universe holds for us. *Nor is it a Russian rocket leaking fuel and spinning as it passes over Norway, though the physics is similar… on a scale a trillion times larger.